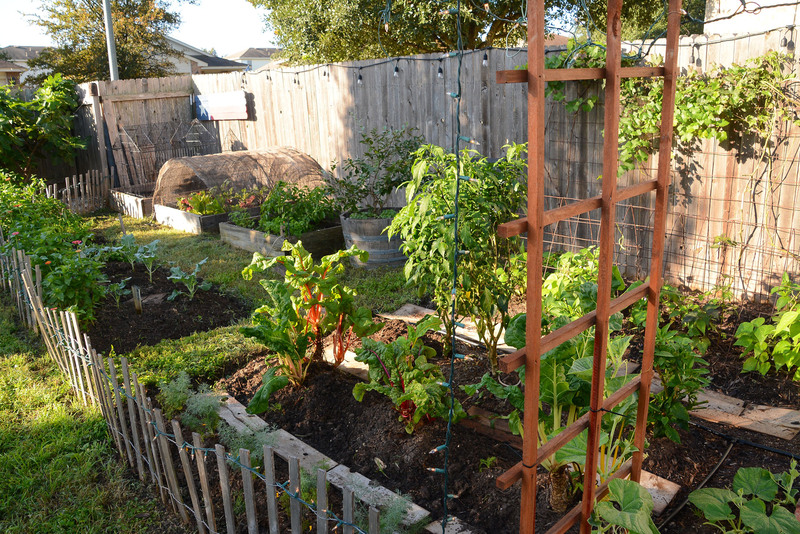 What’s the secret behind the proverbial green thumb? Science. Ph.D biologist and science writer Joe Hanson of PBS Digital Studios’ innovative online-first programs It’s Okay to Be Smart and Hot Mess (climate changes) explores how curiosity opens new adventures of knowledge. Daphne explains the science behind new red leaves on roses (and other plants) and how to tell the difference between fatal rose rosette disease. Find out how to grow native drought-tough crossvine to screen a fence and attract hummingbirds. Herb n’ Cowgirl Ann McCormick analyzes why foliar feeding doesn’t help your plants as much as root applications. On tour at Zilker Botanical Garden, David Mahler of Environmental Survey Consulting and architect Evan Taniguchi created a new riparian garden that illustrates how to grow native plants in shade, along stream beds, and in ponds. 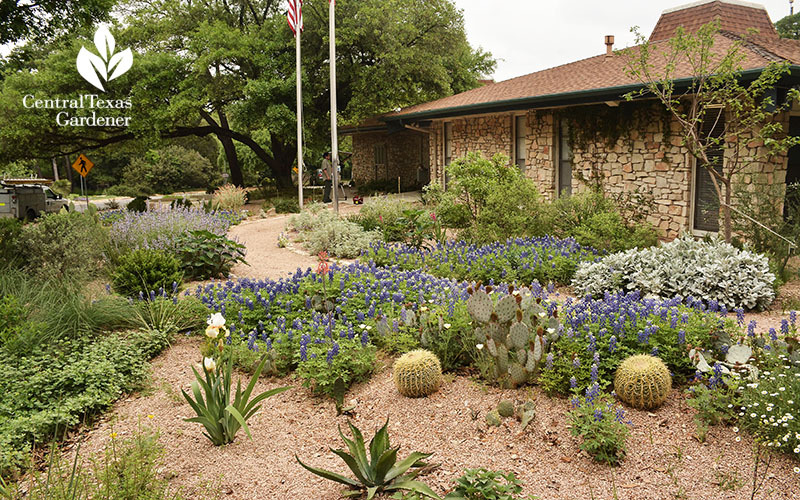 At Zilker Botanical Garden, David Mahler of Environmental Survey Consulting and architect Evan Taniguchi created a new riparian garden that illustrates how to grow native plants in shade, along streambeds, and in ponds. What’s the secret behind the proverbial green thumb? Science. Ph.D biologist and science writer Joe Hanson of PBS Digital Studios’ innovative online-first programs It’s Okay to Be Smart and Hot Mess (climate changes) explores how curiosity opens new adventures of knowledge. Why are new leaves on roses red? Emerging leaves on healthy roses are red. We all know that leaves contain chlorophyll, a green pigment, but many also contain anthocyanins, which have a reddish hue. In plants that have with a high level of anthocyanins in their leaves, such as many roses, those red colors will be more visible if the level of chlorophyll is lower, which it is when leaves are newly developing. Sunlight induces chlorophyll development, so as leaves grow and develop, the green color eventually begins to dominate since leaves don’t absorb green light and reflect it back. As for the dreaded rose rosette virus and the fact that one of the symptoms is new growth being red, those new leaves will also be contorted and twisted, never developing properly. So although the difference between healthy and diseased leaves with rose rosette many not be obvious in the beginning, it doesn’t take long. Find out more about rose rosette disease. Bignonia capreolata Native crossvine is a vigorous woody vine with large, trumpet-shaped flowers that are irresistible to hummingbirds and butterflies. Extremely drought-tolerant, crossvine needs very little water once established. It grows and flowers most profusely in full sun, but can take a bit of shade. But be sure to place crossvine where it will have plenty of room to creep, which it will do very quickly, using its very strong tendrils to grab onto whatever it can find. Plant on a fence or arbor, or use to create a privacy screen. Crossvine is evergreen and usually flowers from March through May, though sometimes blooming again in fall. Floral colors range from yellow to shades of orange, red and even apricot, depending on the cultivar. 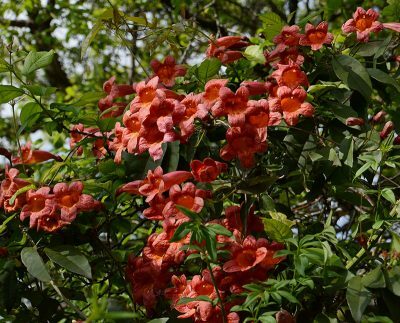 Crossvine blooms on last-year’s wood, so don’t prune until after blooming is done or you’ll risk a year without flowers. Shape and train to control it. Herb n’ Cowgirl Ann McCormick analyzes why foliar feeding doesn’t help your plants as much as root applications.